We just completed a successful trade on RF Micro Devices October $12 calls. 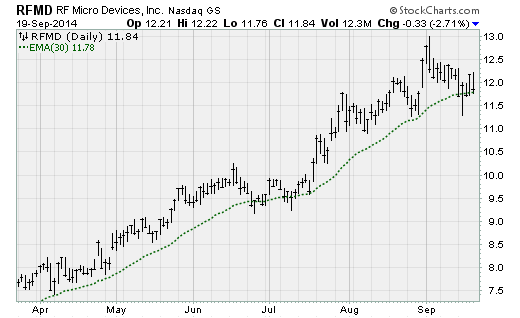 RFMD is a $3.5 billion company that has been one of the stronger tech stocks of the year for good reason: It is one of the top manufacturers of the radio frequency components that are an essential component of mobile devices. Earlier this year, it announced a "merger of equals" with former rival Triquint Semiconductors (TQNT), which is a leader in the space in its own right. The combined entity will have one of the most diverse and advanced chip portfolios in the world, selling power amplifiers, power management ICs, antenna controllers, switch controllers and filters to the likes of Apple, Samsung and Microsoft. RFMD shares were among the best in the market through September before they pulled back for two weeks. We managed to get a great entry in these calls at 45 cents. We then sold on Sept. 19 at 65 cents for a 44% profit.